Indian Society of Agribusiness Professionals (ISAP) was established in 2001, by a group of agriculture and management professionals for capacity building of small and marginal farmers’ agricultural practices that would enhance their livelihoods and income. This would lead to a better quality of life for rural communities. However, with limited access to employment opportunities in rural areas, large scale migration of labor to urban informal sector with inadequate social safety nets and poor living conditions in slums, is a rapidly growing problem. 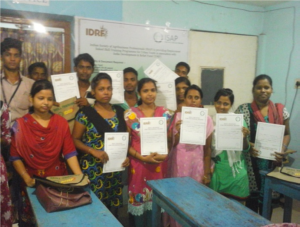 ISAP conducts vocational skill training in below poverty line areas. Rural youth from poor households are trained in various trades to enable them to earn livelihood. ISAP has conducted eight batches of vocational skills training. Youth from poor households are trained in various trades for a period of 45 days in classroom settings and 15 days of on-the-job training. The skill development trainings were imparted in the four domain: Information Technology Enables Services, Bed Side Patient Assistance, Hospitality and Sales and Marketing. An elaborate mobilization process was conducted around the economically backward areas in Odisha in order to identify youth for classroom and practical training through a screening process. Training content was prepared by ISAP subject matter experts. Classroom sessions included presentations and lectures along with live workshops and multi-media presentations. During the on-the-job- training phase, emphasis was laid on hands-on-experience, industry visits, short term apprenticeships, etc. Career counselling was provided to students on the completion of the training program in order to guide and direct their career paths. Training completion certificates were provided to students, and their profiles were shared with the relevant industry people who could be prospective employers. Please click on the link to learn more about the various programs of Indian Society of Agribusiness Professionals (ISAP).